Inge! Walk-Off Grand Slam !!! 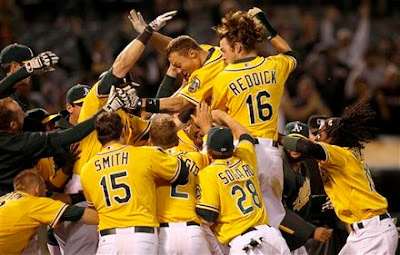 "Brandon Inge, welcome to Oakland and the Coliseum!" "I'm not looking for much of anything there," Inge said, "except for something up that I can get into the outfield." "I'm so happy here right now," said Inge, who was released by Detroit on April 26. "I fit in. It's a new start for me. It's one of those things where I know we have a young ballclub, but they can play. I'm honored to be a part of this ballclub." Brandon Inge, GS again !